SCORING AND ARRANGING: Graham Arrangements – Block Us Up! Boy does the title of this post bring back great memories of my Scoring and Arranging class with the legendary Mr. Ronald J Sarjeant! It was one of the classes we majors were anxious to get in. Really, both of the classes Sarje taught (Music Theory II and Scoring And Arranging) were highly anticipated amongst the music majors during my tenure. I remember on one occasion he asked, “How many songs are included in the fanfare portion of Fanfare And Star Spangled Banner, and what are they?” This was his arrangement of The Star Spangled Banner played by our band, The SCSU Marching 101. The correct answer was; (3) My Country ‘Tis Of Thee, We Shall Overcome, and Lift Every Voice And Sing. And that was just an 8-9 bar fanfare. That should give you a glimpse into this man’s genius. In this class I learned how to arrange and properly score music with and without the aid of a computer. The first step in the process was called “The sketch”. For this we required staff paper, a ruler, and a pencil. We properly aligned our bar lines to create even measures on the staff paper. Then we would play the bass line to our arrangements on the piano keyboards and record the notes on the staff paper notated by a bass cleff symbol which we drew ourselves. Next we would add the melody, chords and counter lines to the staff paper. We would do each “section” of the arrangement like this then take it to him for approval. He would look at it, mark it up, then give it back to us. We would eventually get it approved then the next step would be simply playing, or sometimes manually inputting, the parts into the computer software. closest, in my opinion. We all understand the basics; voicing, proper range of instruments, instrumental groupings for certain sounds, etc. But Marques utilizes chords the way Sarje did, with the perfect blend of simple majors and thick 11ths and 13ths that provide the mature sound of collegiate level ensembles. He also understands how to utilize unison as a tool to “prepare” the listener for what’s coming next. Using voicing as the main tool to “frame” the arrangement is another one of his strongest skills. You will hear the melody begin in one section with the counter lines in another voice then before you even realize it he has switched the voicing smoothly and without interruption. It’s a beautiful effect. Graham is known to take a small band and produce a “big” sound. Big as in full spectrum of sound as opposed to just volume. For example, if you have a great sound system, that sound system will pick up the very high frequencies as well as the very low frequencies to deliver a “big” sound utilizing the full spectrum of auditory frequencies. Listening to a Graham arrangement delivers a similar experience. I’ve heard his sound described as dark, thick, or full. We are all waiting on him to get that large band to hear what that sounds like. Marques Graham is a graduate of South Carolina State University. 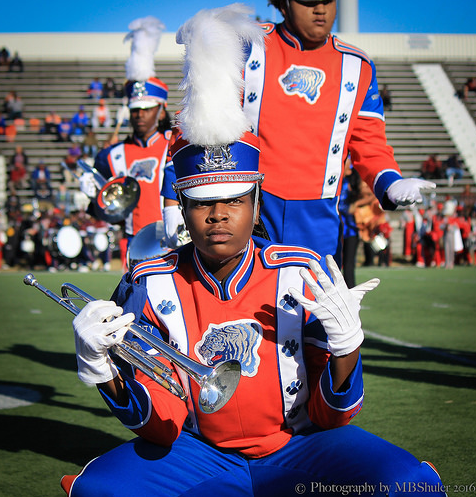 He is the former Director of Bands at Edward Waters College in Jacksonville, Fla and is currently Band Director at Savannah State University in Savannah, Ga. Mr. Graham arranges marching band arrangements for high school and college band programs across the country. Next Post: THE MUSIC BUSINESS, MUSIC EDUCATION, AND THE MIDDLEMAN: Copyrights, Your Rights, Their Rights & Tresona. Marques is a gifted, anointed and appointed musician, composer, and arranger. A great artist can take Very little And turn it into a master piece. That is Marques Graham. He can hear what others cannot hear and see what others can not see. The future holds great things for you. I agree with your assessment, to some degree. Both , you and Graham, are wonderfully talented band directors/arrangers/composers! A couple of the standouts for me? “Something in my Heart”, ‘Rapture”, “I like it” and “Lose My Breath.” Keep up the great work!